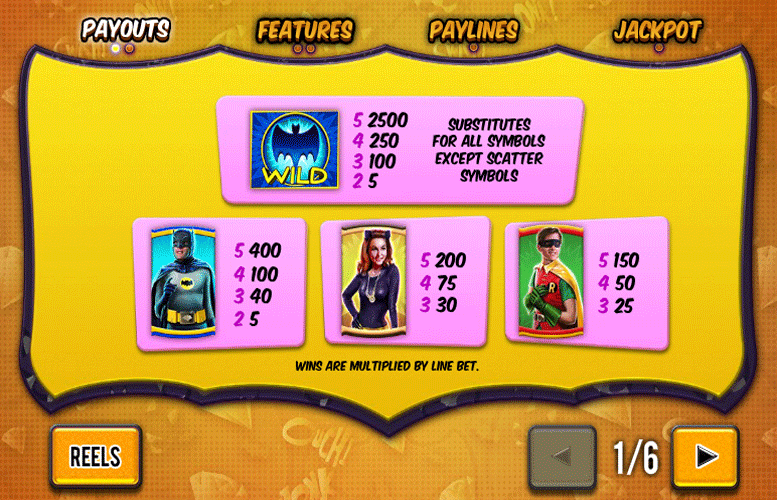 Batman and Catwoman Cash is another one of Playtech’s homages to the classic DC Comics portrayal of Batman. It features a suitably ’60s soundtrack, artwork that’s in-keeping with the original franchise, and lots of great bonus features to boot. 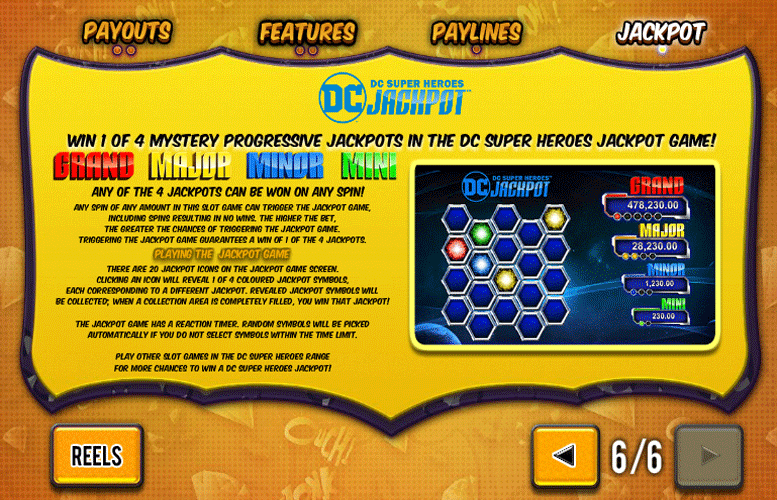 Oh, and there are also some progressive jackpots for players to chase. Dropping one of these is guaranteed when the progressive mode is triggered, so keep spinning for that big money! High main game jackpot. We like games where players can take down a sizeable prize during the base game. Progressive jackpots. Being able to win life changing sums of money on a game is what it’s all about, right? Interesting game features. With several innovative modes, it’s unlikely that players will get bored of this slot quickly. Low upper betting limit. When compared with the similar title from Playtech, Batman Vs Mr Freeze Fortune, the £125 per spin seems overly limiting. Higher rollers will be better served elsewhere. Bat “wild” symbol = 2,500x the line bet. Catwoman = 200x the line bet. Landing the “bonus” scatter symbols on reels one, three, and five will trigger the Batman vs Catwoman Free Games. 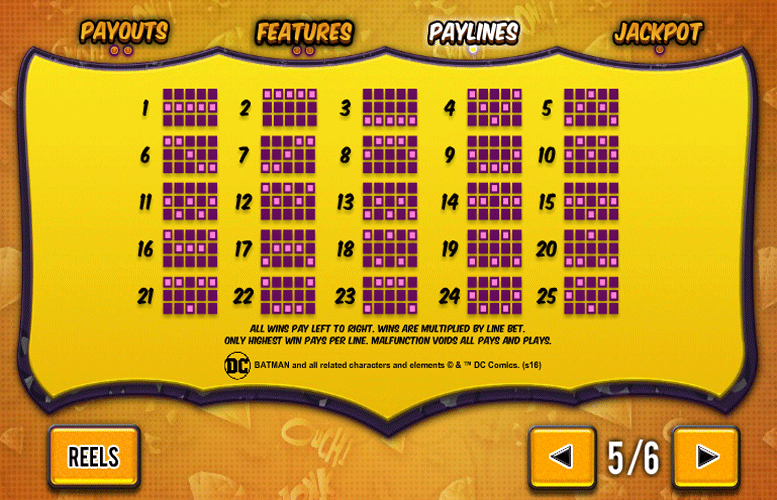 During this mode Batman symbols will award a number of free games and Catwoman symbols super stack symbols. All wins are multiplied by the free games multiplier that increases during the Cat Burglar Bonus. At the end of the free games, diamond symbols on the reels are replaced by scatters. This means that the next 24 spins have a 50% chance of triggering additional free games rounds. 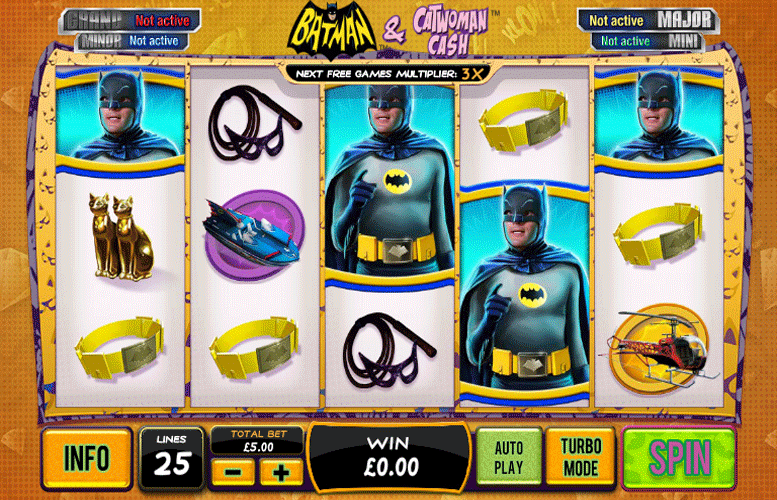 The Batman and Catwoman Cash slot machine is also part of Playtech’s DC Super Heroes Jackpot series. There are four huge jackpots that can be awarded at any time. Any sized wager can trigger the jackpot game too. However, higher bets stand a far greater chance of activating the progressive mode. Once in the bonus game, players are guaranteed to take down one of the jackpots on offer. During the progressive jackpot mode, there are 20 jackpot icons on the jackpot game screen. Players must click the icons to reveal one of four coloured jackpot symbols. Each corresponds to a different one of the four jackpots (Grand, Major, Minor, and Mini). Players must collect all the jackpot symbols of a given colour to win the corresponding prize. The first prize that they fill all the required symbols on will be the one they receive. Batcopter, or Batboat = 100x the line bet. Catwoman’s whip and mask, or pair of twin cat figures = 75x the line bet. Batbelt, or Batarang = 50x the line bet. The number of win lines are fixed on Batman and Catwoman Cash at 25. The only figure that players can alter is the total bet. The minimum here is just 25p and the maximum is a somewhat uninspiring £125. Clearly, Batman and Catwoman Cash was not designed with the highest rollers in mind. This slot has a lot going for it. Those who love the original ’60s version of Batman will certainly appreciate the fond recollection it presents. However, it also has enough in the way of features to win fans from outside of the comic book niche. Batman and Catwoman Cash pays handsomely during the main game and players are also able to drop a life changing sum of money in the game’s progressive jackpot mode. All told, it’s a lot of fun and potentially lucrative too.